Chuy’s Mexican restaurants have happy hour deals and daily specials at most locations. Bottle of Wine – $3.00 OFF. To view the specials for your Chuy’s select your location then click View Location Info. To start, visit: Chuy’s Locations. Many Chuy’s also have Daily Specials; you can find a link on the Location Info for your local Chuy’s. The screen capture at left illustrates how to view these specials for one location. Chuy’s is a Tex-Mex restaurant chain established in 1982, by Mike Young and John Zapp. The company currently has 98 locations and 6 locations ( Huntsville, Carmel, Vintage Park, Overland Park, Lexington, and Colorado Springs) currently under construction, as of August 2018. 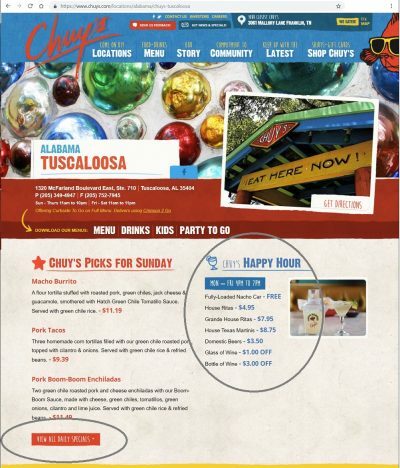 Chuy’s currently has restaurants in 19 states: Alabama, Arkansas, Colorado, Florida, Georgia, Indiana, Illinois, Kansas, Kentucky, Louisiana, Texas, Tennessee, Oklahoma, North Carolina, South Carolina, Maryland, Virginia, Missouri, and Ohio. Every year on Elvis Presley’s birthday, January 8, most locations host the Elvis’ Birthday Bash, during which an Elvis impersonator visits the restaurant. Chuy’s also annually hosts a Green Chile Festival at its locations, celebrating the harvest of the Hatch Green Chiles from Hatch, New Mexico. Chuy’s is a sponsor of community events such as the Children Giving to Children Holiday Parade.